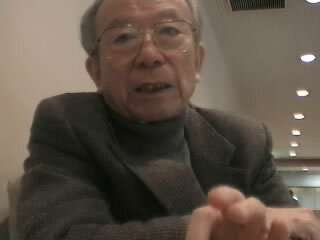 Mr. Hirotami Yamada's Testimony. [ TEXT MODE ] to movie(flash) page. to personal info page. I As I mentioned before, I was born in 1931. When the atomic bomb was dropped in 1945, I was 14 and in 8th grade. I used to live in an apartment complex in a new residential area in Nagasaki. I wonder how many houses existed there. It was such a beautiful town with low hills in the south, west and north. and it was said to be the safest place in the city. Then, the atomic bomb was dropped 300 meters away from Shiroyama Primary School. If you measure the distance on this map, it was about 900 meters away from my house. 900 meters mean about a ten-minute walk from where the bomb was dropped. My family consisted of 6 people ? my parents, older sister, younger brothers, who were in the 6th grade and only 9 months, and myself. My father was teaching at a commercial school at the time, and it is a commercial high school of today. Students were obliged to work at war factories instead of studying at school as expected during that time. so, my father used to take his students to big Mitsubishi Factory, where Nagasaki University exists now. Since it was such a large factory, the distance from the blast center varied depending on where you were in the factory. The place where my father was bombed…..
You know, the atomic bomb victims like us carry sort of ID cards. The ID is called “bomb-survivor’s health card.” It specifies in which town you suffered from the bomb, and how many kilometers it was away from the center of the explosion. My father’s health card says he was 1,300 meters away from the site. n my case, there was a junior high school that I used to go to in the east and it was on the way outer fringes of Nagasaki city. There was a factory inside of the school. and students in our grade were working there. For some reason, I was in the group to attend classes. My junior high school was for the elite so to speak. I mean, many of us were supposed to proceed to military schools. That is why we were treated nicely and were able to take lessons unofficially, although there were supposed to be no lessons. An air-raid warning was put out in the morning on the day the atomic bomb was dropped. We didn't have to go to the school when the air-raid siren came out. It took almost an hour from my home. There was a train running at that time as well, the inner city trains. People used to see its cocky for junior hish school students take trains. I walked since it was a time I would get hit if I get caught riding a train. So that case, I would be late for class by walking to school after the sirens been cleared. and Nagasaki had almost none damage from air attack. So I didn't take the sirens too seriously and kept going to school. That lead to me saving my life. This says 3.3km on my ID,too. The building was warped though. It was sometimes an old wooden school building. I was afraid that it would break down because I was at 2nd floor at that time. Then all the windows were broken down, and the celling was to fall down, so I was really surprised. But I never got injury at all. And I didn't know what happened. I guessed a big bomb fell down in neighborhood. If the bomb is fallen down, it breaks houses or hole, but there was not such an attention. I couldn't leave there because I feared that there remained the bomb, though I didn't know what happened. It is said the time the bomb was fallen down was 11:02 am. Then I had been with my friends in the classroom for about an hour. And our teacher showed up and said "Go home now", so we followed him. But the way home was difficult. Just about Nagasaki station area is halfway point between Junior high school and my home. Not much of damage the way to Nagasaki station. But,the fire started near Nagasaki station,what's more, nobody fights a fire. And it get worse and wose,we couldn't go over the station. So,I got home up and down the mountain. So many people died and injured people sat on the wayside on my way home. My mother,sister and two brothers live my home at Shiroyama-machi. I'm sure they won't live.I don't know they're safe. So,I couldn't look over around while I was way to home. Then I arrived home. And our house was completely flat. Fire was spread to right below us. It was already flared up. Our house was located in the midddle of the hill and it was slightly above the city, so, the row of houses including ours was not on fire yet. but such pattern occurs only near the center of explosion. and it outblazed through to the end. Although the lower part of the hill was sea of fire, our house was located on a hill so row of houses including ours got away from it. However, they were completely flattened. At that time, there used to be an air-laid shelter, slightly far from our house, dug jointly by a neighborhood association, which should be today called residents' association. It was quite big. We used to tell each other that we should go there in case of emergency. I did not see anyone in my house and went to the shelter. I was wondering what was really happening on the way. neighbors were sitting by family unit. And, I found 4 of my family members. I saw them and they were not really injured stunningly. we were saying that "What a relief. This is great, though our house is in shambles." We thought that although our house was completely messed up, we could deal with it as long as we were alive. We encouraged each other and the day ended. My father isn't home yet though,"he'll get home soon".We're family of six,anyway,we're fairly safe except my father. And my mother and another family was in home,and then our house crushed. and a nine-month-old baby had a nap in the Japanese futon. And then the Japanese futon wraped around baby's body as a cushion,so the baby suffered no hurt in the accident. My mother and another family got injure though that's like a scratch,compare the people got injury by the Atomic bomb. it was not really serious wound like he did not stop bleeding and was going to die. Anyway, we said to each other "It's good! It's good!" and the evening ended. there were a terrible flash, the explosion sound, and the blast, but they occurred only once. At that time, we heard stories of air raids here and there. people were burnt to death and houses were on fire. But, in case of Nagasaki, the explosion of the bomb was heard only once. What is more, it was not known where it was dropped, and when you see the reality that the fire was spread to such a large extent, it was not explainable. People did not understand what had happened for a while. And,1 day passed, 2 days passed, and on the third day, my baby brother, who was not injured at all died. He stopped breathing. And, my mother was holding him, shook him like this and she was calling out his name. But he was dying with no reactions. This was one of the things that cannot be understood. It was understandable if he had been badly injured and died, but he died without injury at all. My mother slept on that night holding the dead baby in her arms and saying "why did you die?" Sleeping means just to lay on the ground. A family of four ... No, a family of five slept by staying close to each other like this. And, my elder sister was dead when I woke up next morning. She was weak. That is why she stayed home. If she had been physically stronger, she would have been forced to work at some factory. She was two years older than I and she was dead. It was on 13th, but we did not know whether she died late at night on 12th or early morning on 13th. in those days, it was not known that the bomb being dropped was the atomic bomb, and we also did no know what radiation was. Not having enough food must have been another reason, but we were feeling so listless and did not feel like doing anything. We were spending every day like that and my 2 family members died in such situations. At that time, corpses were lying everywhere near my house and they started going rotten. They were left in high temperature. So, it was natural that they got rotten. Corpse looked cruel but they were looking more and more cruel. so, we thought that we had to cremate them soon. Fortunately, in a way, there were a lot of woods remaining unburned. And, by that time, you could see people cremating corpses by themselves here and there. The corner of the field and vacant lot. We followed them by observing them. We piled up woods, laid the corpses , and cremated them. it took such a long time to cremate them. that though I was the one who did those work directly, my mother was near the fire. After all, I have really regretted that she was near the fire. It is hard enough for a mother to face the fact that her children died. and it must have been something that cannot be described with words like sad. Why was not I able to notice it? I really regretted it. I noticed it after some time passed. At that time, I was in 8th grade and could not understand such mother's feelings yet. My mother, who experienced such difficulties as a human mother, lived only 10 more days. with my brother and sister’s remains but there was nothing to put them in. One of them was already 16 years old and was almost an adult, so the little can for powder milk was not big enough to have all the remains in. As we could not put most of the remains in the can, we dug a hole in the corner of the vacant lot to bury the remains. And then we wrapped the can with a furoshiki, a square piece of cloth, and went to Isehaya Bay. When we arrived there, my grandmother told us that my father had been hospitalized in the area. After all, he was terribly injured. He got burnt on the front side of the body. From the face to the chest, the stomach and both arms ? especially the face and the arms were awful as if there was no skin left and flesh was exposed. I wondered for how many days he can survive instead of feeling glad when I met him. There was a big “naval hospital” in Isehaya Bay and that is where he was hospitalized. We went there and were allowed to stay as my mother and brother were quite tired, plus we wanted to nurse my father closely. Then, my brother in 6th grade had bloody diarrhea . This occurs to the bomb survivors frequently. Radiation damages intestines and they bleed. Small vessels get damaged by radiation and bleeding occurs all over the place, though I do not know the mechanism. For example, someone bleeds from gums or spots appear when capillaries are torn under the skin. Such symptoms are widely known today as radiation damages, but even doctors did not understand them back then. That was the naval hospital, so doctors working there were army ones. Conditions of, I mean, common practice in battlefields did not apply to the atomic bomb. So, when an army doctor found out that my brother was having bloody diarrhea, he diagnosed it as dysentery and sent him to an isolation ward alone. He was supposed to be with our parents as we luckily united but then he had to stay in the isolation ward. After we went to the hospital, my mother gradually became weaker and passed away on the 23rd. And, my brother also fell into the condition where he was semiconscious and we were not sure whether he was awake or not, and he passed away the day after my mother did. After all, my mother and brother died on the 23rd and the 24th respectively. The bomb was dropped on the 9th ? so all 4 people in my family, who were either not injured at all or who were slightly injured died in about 2 weeks. Speaking of ‘terrible thing,’ it turned out that occupying troops were going to take over the naval hospital in September. Instead of treating the bomb casualties, they were going to get rid of patients. This circumstance was one of the reasons why we moved to my grandmother’s house. Another reason was that my father did not want to stay in the hospital, where my mother and brother passed away. And,The general practitioner came to the house, and he took care of my father. To my wondering, he's getting better even though he had such a cruel burn. And, he returned to teach the mark of hi, with the mark of cruel injury and burn remained. The school where father had worked also had completely got damaged. And a lot of students were die or injured. The teacher and students restarted the class, remaining their mark of injury, really. Anyway, I was able to continue the school because he could take up one's post like that. So, I was able to go with the junior high school, the high school, and the university. Father seemed like very energetic. However,Father had a fit of coughing in the summer 1961, as 16 years passed since that bomb was fallen down. So,I said to father that he had to see the doctor. There are hospitals that are called an atomic bomb hospital in Nagasaki and Hiroshima. It is a hospital of the Japanese Red Cross. As soon as he arrived there, he got into the hospital at once. It was a lung cancer. It was too late, and he died in December, 1961. Six person family lived in the place said to be the safest in Nagasaki for such reason. Only I survived among this six family after all. And,I also worry about my health. I don't think it had a big influence on me, becasue the distance between the place I was being at that time and the ground zero was as much as 3.3 kilometers. I passed the place of hundreds of meters away from the ground zero around four o'clock . And, we lived until the 14th. Moreover, we often spent time by sleeping on the ground. Grounds are dangerous, aren't they? I parrot that, hough. When the neutron is irradiated to the material,they come to have the radiation.For instance, stone and mud, etc. It is said secondary radiation, and we lived among such a circumstance.